Photos Liz Martiniak. ©Liz Martiniak 2003; all rights reserved. 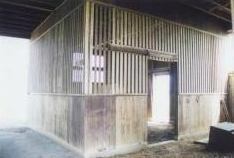 FARAWAY FARM was purchased in the mid-1920s by Samuel Riddle as a permanent home for his champion runner MAN O'WAR, his broodmare band and other stallions. The farm also was home to the horses owned by Riddle's niece and nephew-in-law, Mr. and Mrs. Walter M. Jeffords. After Riddle's death the property was divided into separate farms, including one known as "Man O'War Farm." Faraway Farm stayed in the Jeffords family until very recently. Faraway Farm has recently been sold and is undergoing extensive renovations, while maintaining the historic importance of the place. The cemetery where MAN O'WAR and several of his best offspring were buried (WAR ADMIRAL, WAR RELIC, WAR HAZARD, WAR KILT, and the mare BRUSHUP, dam of WAR ADMIRAL) were moved along with the great horse's remains and bronze statue in the early 1970s to the Kentucky Horse Park. The graves pictured here are located near the Faraway Farm stud barn. One of MAN O'WAR's first mates was the imported mare *LADY COMFEY, who produced 3 stakes winners by him: American Flag, Fleet Flag and Ship Executive. American Flag was his sire's first champion and joined him at Faraway Farm at stud. He was given to the U.S. Remount Service in 1942 and died later that fall at the Remount station in Front Royal, Virginia. CHRISTMAS STAR was the dam of stakes winner MARS (by MAN O'WAR), who also joined his sire at stud, dying here in 1949. THE NURSE produced 2 champion fillies by MAN O'WAR, Florence Nightingale and EDITH CAVELL. *GOLDEN BROOM was a French-bred colt purchased as a yearling at Saratoga by Mrs. Walter Jeffords, from the same crop as MAN O'WAR, and retired alongside the great horse, becoming a useful sire. Other horses buried at Faraway include ACE CARD (stakes winner by Case Ace - Furlough; dam of 4 stakes winners including champion One Count, Yildiz, Post Card and My Card), COQUELICOT (by Man o'War; dam of 2 stakes winners including champion Pavot and Lovat), CREOLE MAID (by Pharamond II-Baton Rouge by Man o'War; winner of the C.C.A. Oaks and dam of stakes winner NATCHEZ), FURLOUGH (by Man o'War; dam of stakes winners Adile and ACE CARD), OPEN SESAME (by *Mahmoud; classy stakes-placed filly), RAMBLER ROSE (by Man o'War; dam of stakes winner Trymenow), REGAL LILY (by Man o'War; won Alabama Stakes), and WAR REGALIA (by Man o'War; sister to REGAL LILY; stakes winner; dam of stakes winners Sagittarius and Masud) -- A.P.